T housands of area youth took to Dripping Springs Ranch Park for the annual Hays County Livestock Show and Expo. The event kicked off Jan. 12 with a horse show, which was then followed by the main expo Jan. 22-26. 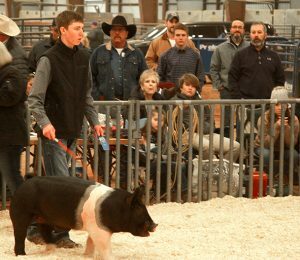 Left, Jackson Roberston, a Wimberley High student, received first place in the Hamshire competition at the Hays County Livestock Show. The judge said Robertson’s swine had a great build and stature, which won him the prize.